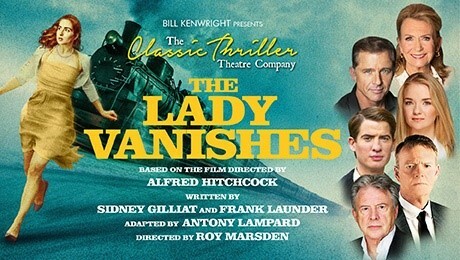 It is classic thriller time In Hanley as the Regent Theatre stages an adaptation of Agatha Christie’s The Lady Vanishes. The production by Bill Kenwright’s aptly-named Classic Thriller Theatre Company is based on Alfred Hitchcock’s film from 1938. Directed by Roy Marsden this is a true ripping yarn that is delivered at a cracking pace by its star-studded cast. All of the main actors are familiar from television in addition to their wide-ranging careers in other mediums. The action is set in a middle Europe on the brink of war. Iris is a young woman on her way to England to marry into money and, after an accident on the station platform while boarding the train, she is befriended by a kindly older woman who claims to be a children’s governess. However, when the lady disappears and none of Iris’s fellow travellers can remember seeing the two together, the mystery deepens. To some extent the characters in the play are stereotypical of a middle-class group of people who could afford to travel in luxury in the 1930s but it is a credit to the performers themselves that these characters had life breathed into them and were made believable. The supporting cast play multiple roles and added presence to the production with Joe Reisig having the stage presence to become a very convincing Nazi official while Juliet Mills (Wild at Heart) gave a performance that shows why she is a grande dame of British theatre. Maxwell Caulfield (Emmerdale) is very convincing in his role as a European neurosurgeon who hides his sinister depths behind a soothing bedside manner. Robert Duncan (Drop the Dead Donkey) and Ben Nealon (Soldier, Soldier) are excellent. They provide the comic relief as two cricket enthusiasts who are only interested in getting back to England but come up trumps in the end and Philip Lowrie (Denis Tanner in Coronation Street) plays his part – as a reluctant adulterer who is more concerned for his reputation than his mistress – to perfection. But the standout performance was that of Lorna Fitzgerald (Abi Branning in EastEnders) who puts in a rousing performance as Iris. Lorna brings all of her acting skills to the fore as she moves from being a giddy girl at the beginning of the play to become a more mature adult by its finale. Thanks to her sincere characterisation, the audience is more than willing to empathise with her as she struggles to solve the mystery. Iris is ably helped by Max (James Boswell) who is well cast as a young man travelling Europe to research folk music. After a poor start to their relationship there is a real on-stage chemistry between Lorna and James as they eventually become heroes of the hour in a thunderous climax to the drama. Additional credit must be given for the professionalism of James who came into the cast as understudy to Matt Barber of Downton Abbey fame. Special mention must be given to the Creative Team whose excellent staging provided an atmospheric opening and whose simple sets were very adaptable. The use of the correct background lighting gave a credible impression of movement of the train. Costumes, hair styles and props all gave the whole experience a “period feel”. Members of the audience gave the cast a rousing reception at the final curtain with a chorus of cheers for the leads. The players responded with three bows after what was truly a five-star performance. The production has a running time of approximately two hours including interval and continues its run at the Regent until Saturday 13th. Next articleStaffordshire Fire and Rescue Service has released a fresh plea following two more incidents involving the ‘SAME’ factors.